Some modules are actually integrated within the core or basic modules, for example, the Advanced Planning and Scheduling module will appear embedded within the standard Scheduling module. Job Management is the heart of your Epicor ERP software if you are a manufacturer. The Job Entry utility accesses information in the sales orders, purchase orders, inventory, and other sources and pulls this information into the job. Besides using the Job Entry utility to create a job, you can use the Job Manager and the Planning Workbench. Use the Job Manage to review demand for a part and the use it to create the supporting jobs. You can use the Planning Workbench to evaluate suggestions based on sales orders, other jobs, and inventory requests. Then you create the jobs which are needed. Using the Manufacturing Execution System (MES) your shop employees can record their time against job operations which provide one of the four costs required for job costing. Use the Job Tracker to accurately review the current real-time status of any job. At any point in the process, you can review a job through three key reports: the Job Traveler, the Production Detail Report, and the Time Phased Material Requirements Report. Each report helps your supervisors manage job production from operation to operation. The production cycle is completed when you indicate production is complete and when the job is finally finished, or closed. The part quantity can then be shipped to your customers, completing the job management process. Scheduling is the most powerful module in the Epicor ERP software suite. Scheduling considers job quantity, job setup time, job production time, resource capacity, and other factors when computing the time it will take for each job to complete. The schedule for all jobs can be review on the Job Scheduling Board, the Resource Scheduling Board, and the Multi-Resource Scheduling Board. In order to fine tune your scheduling, consider using the “What If Scheduling Board.” This tool enables your scheduler to consider different scheduling alternatives and the impact each has on the actual schedule. If you are performing Infinite Scheduling, use the Overload Informer to determine the resources which have more work than available capacity. Once you know where your bottlenecks are located, your scheduler can select the best alternative from: use alternative faster resources, use multiple resources instead of just one, work overtime, subcontract the operation, or simply accept the job being late. The real workhorse is Finite Scheduling. Using this utility renders the Overload Inform useless, because with Finite Scheduling, no resource will be scheduled with more jobs than it capacity can handle in it standard capacity configuration. It is Finite Scheduling which makes scheduling the ,most powerful module in Epicor ERP. Engineering is used to define the materials, components, subassemblies, operations, resources, setup time, production cycle times for manufacturing any part. The materials, components, and subassemblies comprise the bill of materials (BOM). The series of operations define the bill of operations (BOO). Together the BOM and the BOO make up the method of manufacturing (MOM). Each MOM is tied to a Part Revision. Once the part revision is created, it can be checked out to the Engineering Workbench. It is here the MOM is link to the Part Revision. This process tracks the description, reason, and approvals for the revision. You can have multiple Part Revisions for a Part Revision and these are called Alternate Revisions. You would most likely use Alternate Revisions if you made the same part at multiple site and each site had different resources. 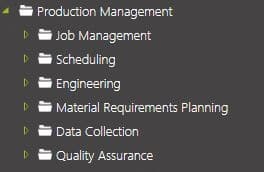 Material Requirements Planning (MRP) is a set of utilities you would use to determine demand, supply , and to propose additional supply. This is accomplished by auto-generating jobs, purchase orders, and transfer order suggestions. MRP is normally used by companies that are make to stock or mixed-mode manufacturers and that run both custom and stock products. In addition to the demand created by jobs and sales order, you can create future demand with both the Forecast Entry and the Master Production Schedule. When your forecasts and master production schedules are entered, you run Process MRP. This process creates unfirm jobs which you can then make ready for production within Job Entry. It also generates purchasing and manufacturing suggestions that display within the Planning Workbench and the Buyer Workbench. Use these suggestions to create jobs, transfer orders, and purchase orders. Before you use this functionality, you must have accurate methods of manufacturing designed for your part records, solid Engineering Change Order (ECO) control, accurate inventory records, Lead Time values for purchased and transferred materials, and proven capacity estimates for resources and resource groups. Quality Assurance and the Enhanced Quality Assurance modules tie together all quality functions. Some of which are: scrapping end parts, rejecting raw materials, tracking first article inspections, indicating when parts are not compliant, et al. With Enhanced Quality Assurance, develop Inspection Plans, perform Skip Lot inspection when receiving parts from suppliers, and you can also track internal education and training for your employees. Some of the quality functions you might use to process parts that require inspection are: non-conformance, inspection of purchase order receipts, first article inspections, DMR processing, and with Enhanced QA you can record inspection results and then you can run the Inspection Data Tracker to view the inspection results. If a job material, job assemblies, inventory, customer returns, or purchase order receipts that fail inspection, they appear on the Discrepant Material Report (DMR). Then you Material Review Board has the responsibility to reject or accept these parts. If accepted they are then dispositioned to a job, reworked, or to inventory. A corrective action can be added to the process. This records what happens to the material.